Our Sister’s Place is participating in the Great Charity Challenge 2019 and would love for you to join us. Stop by and meet our committed Board of Directors and Volunteers and learn more about Our Sister’s Place how you can help us continue our mission to support victims of domestic violence through our programs and services. By attending this program, you can learn more about this issue in our community. Join us for our 6th Annual Fashion Show and Luncheon at McCarthy’s Pub in Tequesta featuring Gretchen Scott Designs. Our Sister’s Place offers direct services to victims and those at risk of domestic violence in northern Palm Beach County through The Outreach and Advocacy Program. Support Our Sister's Place in its mission to assist victims of domestic violence. Our Sister's Place presents the 5th Annual Casino Night on March 24th, 2018 from 6 - 9pm in Jupiter, Florida. All proceeds support victims of domestic abuse. featuring Survivor and Author, Aria Gmitter; Survivor Toni; Al Raigue, President, Board of Directors, Our Sister's Place; Hazel Raigue, Executive Director, Our Sister's Place; Dave Aaronberg, Palm Beach State Attorney; and Lt. James Pike, Village of Tequesta. Join us on Saturday, October 7th for an Open House. 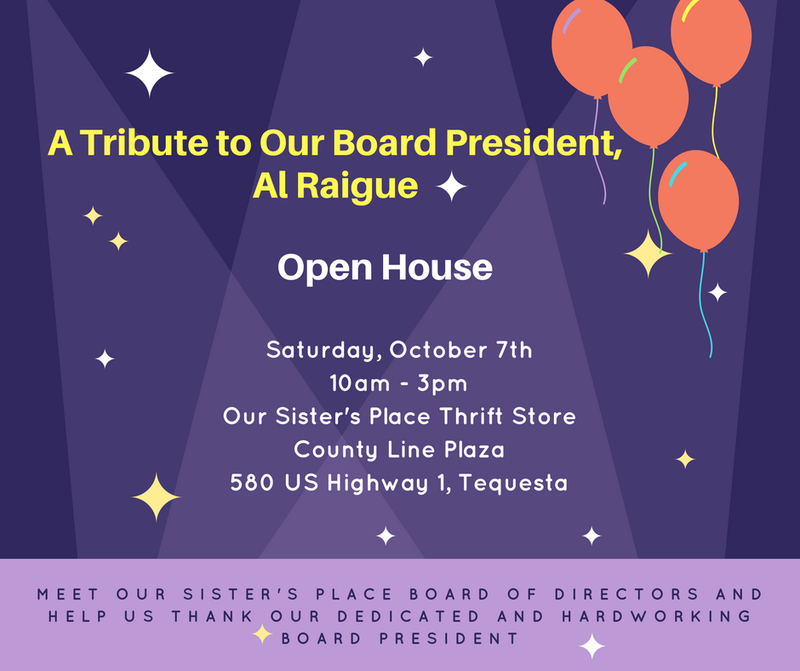 Meet our Board of Directors and help us pay tribute to our dedicated Board President, Al Raigue. In addition to providing leadership, keeping records and grilling hot dogs, Al's unwavering commitment to Our Sister's Place mission of advocacy and outreach finds him helping with moves, hanging t.v. 's, and running errands on behalf of our clients. The Domestic Violence Council of Palm Beach County is kicking off Domestic Violence Awareness Month on Tuesday, October 3rd from 2 - 4pm. Did you know we are currently working with 22 children who have witnessed domestic violence in their home? Help make their Easter a little brighter by picking a gift from the Easter tree. Support Our Sister's Placein its mission to assist victims of domestic violence. Santa Day Hot Dog and Holiday Sidewalk Sale in Tequesta. Shop local and support our organization in its mission to assist women who are victims of domestic violence. The work we do saves lives. We’re here for the long haul with every woman we help, standing by her until she has her life stabilized and secure. 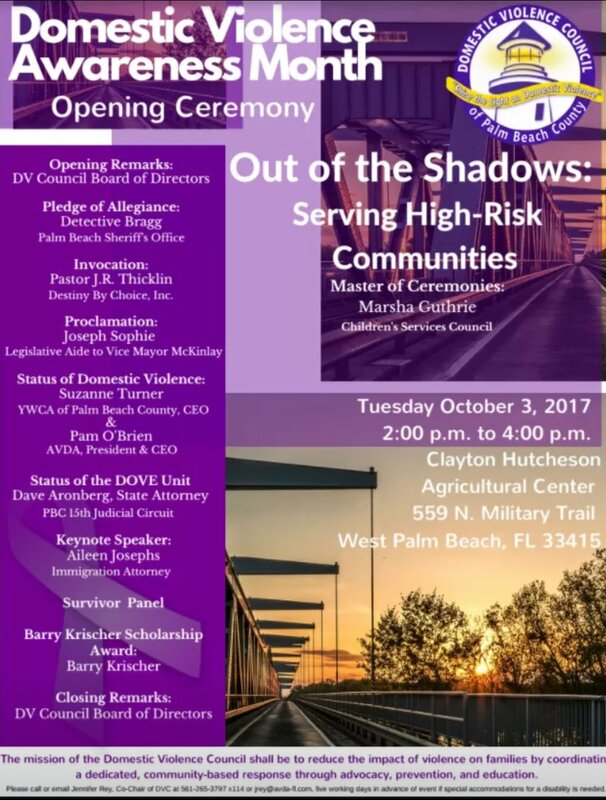 Our Sister’s Place, Inc. is proud to sponsor our 4th annual “Shine A Light On Domestic Violence” Awareness Event on October 20, 2016 at 7 p.m. at the Jupiter Lighthouse. Please join us and our guest speakers as we stand strong with victims and survivors and proudly partake in our own Domestic Violence Awareness Month activity. We stand together with all those who work so hard to end domestic violence and ask you to “Take A Stand Against Domestic Violence” with us as well. McCarthy's Pub has generously offered one FREE drink (house wine, beer, or soda) with ANY purchase during the Shop and Learn event on June 28! Music will be provided by Somnis and Our Sister's Place Staff and Volunteers will be there with information about our programs and services. Join us for some Saturday fun! Join us for lunch and 15% off.